A 58-year-old man is in critical condition with a serious head injury after he was knocked from his bicycle by a vehicle, according to the Bellingham Police. The incident occurred around 4 a.m. Wednesday morning on Byron Avenue in Bellingham. The car involved in the collision was driven by a 69-year-old woman, police said. Reports say the woman was driving away from a stop sign when she struck the man. Both the man and the woman are Whatcom County residents. The man was taken by ambulance to PeaceHealth St. Joseph Medical Center in Bellingham. Further details were unavailable Wednesday afternoon. The collision remains under investigation. Bicyclists are at a severe disadvantage when they collide with motor vehicles, even at low speeds. Wearing a helmet can help in the case of an incident. Without protective equipment, bicyclists bear the full brunt of the collision and can suffer catastrophic injuries. If you or a loved one has suffered a traumatic brain injury (TBI) in a bicycle accident with a car, it’s a good idea to consult with an experienced bicycle accident attorney. Attorney Chris Davis – founder of Seattle-based law firm Davis Law Group, P.S. – has over 20 years of experience handling such cases. 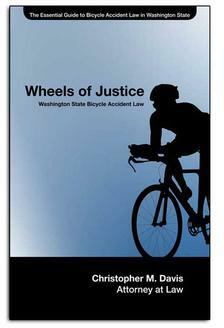 He will fight to get full compensation for the victims in bicycle accidents. Our attorneys and legal team thoroughly investigates accidents scenes, talks to witnesses and hires experts to determine who is responsible for an accident. No stone is left unturned. Our staff pursues all sources of available compensation while our clients recover. You can rely on Davis Law Group to fight for you and take on the insurance companies. For a free case evaluation, call (206) 727-4000, use the chat feature below or fill out the form on this page.